This is not the first flowchart that I posted here. You can also check flow charts for nonlinear geometry and nonlinear material. The first questions (well, two questions actually) are pretty obvious. Will 2 bodies contact in my model? This is a rather straightforward question. Do you have 2 objects that can touch each other in your analysis? Sometimes, this may be a bit more tricky, when you are not sure if they will deform enough to touch. Usually, it makes sense to verify that in the model without contact and then add contact if needed. If you don’t need contact this will save you some computing time later on. However, if the contact is there “from the start” (no deformation is needed), there are some simplifications one can try. We will discuss them later. When you check if two elements of your model will be in contact, remember that you need to check deformations with the scale of 1! Usually software “adjust” deformation scale to model size or whatever – but you are interested in “real” deformation in this case! (more on this here!). Will something contact a rigid support? Think about it this way: not all supports work in both directions. Sometimes they carry only compression or tension (compression is far more common BTW). If this concept is foreign to you, please read the article I mentioned earlier. There are several ways you can deal with this. You can model nonlinear supports (i.e. such that work only in compression) but usually, you will simply add a rigid surface where the support is and define contact there. The trick is not in how you do it, but rather that you know that a simple “pinned” support in that region won’t work! Great – we have the basics behind us! If the answer for at least one of the above questions was “yes” then you are at least “in the contact zone”. This is not a “tragedy” yet (if you consider defining contact tragic that is! ), but we are closer to it without a doubt. Do I want to try to avoid contact? The thing is, that from the previous 2 questions you already know that there is contact. You can try to “avoid” using it, but if you don’t want to try avoidance, simply define contact and move on! So if you don’t suspect there will be a lot of contact convergence issues (or you did a similar job before and you happen to know parameters that simply work great in such cases) then say “no” define contact and move on! However, often model you will analyze will be big or will have other non-linearities at play. In the worst case scenario,g you may want to use “linear contact” which is an incarnation of convergence problems! In such cases trying to avoid contact in analysis seems like a good move! A contact is a tool and a useful one without a doubt. But it comes at a price of high computing time, especially in steps when contact “closes”. Sometimes you may also experience convergence problems. In such cases trying to avoid contact seems a good move. Is this an initial contact? By this I mean – does elements touch at the start of the analysis? If not they will have to deform first and then get in contact. Problem is, that this almost eliminates any chance for simplifying it. You see, simplification will be based on adding supports or connections. But when contact is not “initial” it means that you need deformations to “hit” support later during analysis (or another element of course). You won’t be able to use a simple support (or connection)… since it’s not there at the start! In such case, you can always try to use gap elements… But I have no idea why would you do that (!). There is no obvious benefit (unless your license doesn’t allow contact I guess). Wise-man knows when to run! Can you predict where the contact zone will be? This is the “oracle / wise-man from the mountains” type of question. Luckily for us, oftentimes the answer is obvious. In general, contact works like this: you can transfer compression forces (sometimes friction as well), but you don’t carry tension. This means that were compression forces are transferred you have a connection. If tension is present there is no connection. So… if you can predict where compression will be, you can model the connection there, and ta-da! 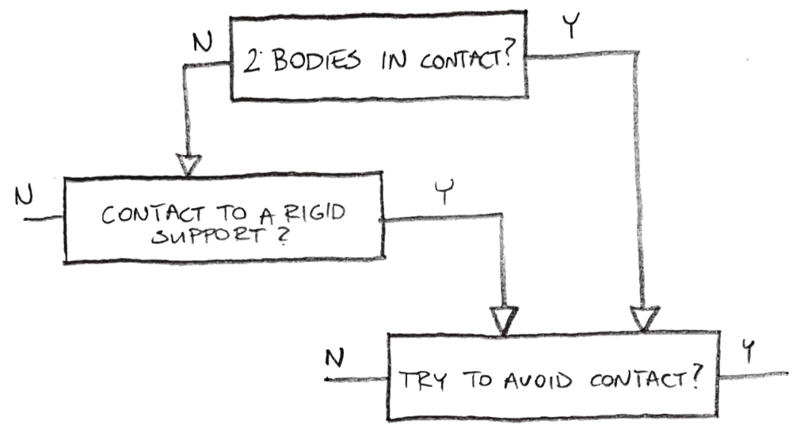 You just made what contact would… but without those pesky iterations and convergence issues! In other words, if you can predict where is the area where compression will be transferred you are fine! Just connect or support that area, and do nothing where the tension will be! Just be aware that this can be done in iterations. It is possible that you will “miss” where compression is. This means that you will get tension in those additional elements (instead of compression you assumed). You can, of course, delete the “connection” where you got tension and re-calculate the model. Problem is… that you are starting to do manual iterations… something contact does for you automatically! So unless you are fairly certain you can guess where the contact is at the start… don’t use this simplification. You will waste a lot of time! Still interested in avoiding contact? Let’s assume you had a good “guess” where the contact will be. And you want to avoid it. So you connected element where contact will be (or you supported the model where contact to rigid support will be). You also checked if there is no tension in the connection/support just to be sure you guessed right. This shows, that the plate was to “weak” and since you only connected/supported the edge… part of the plate went through your support! Is my model rigid enough not to deform “through” contact? But let’s be positive for a while! 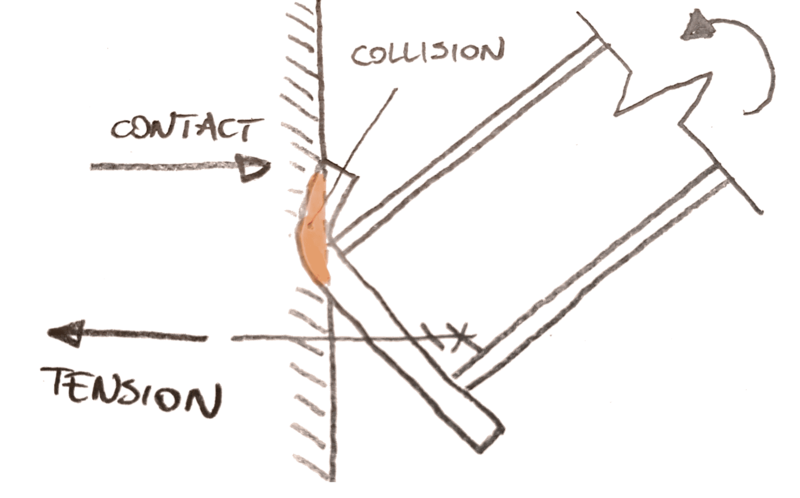 If your model is rigid enough and it does not go in “collision” as I marked above… you made it! 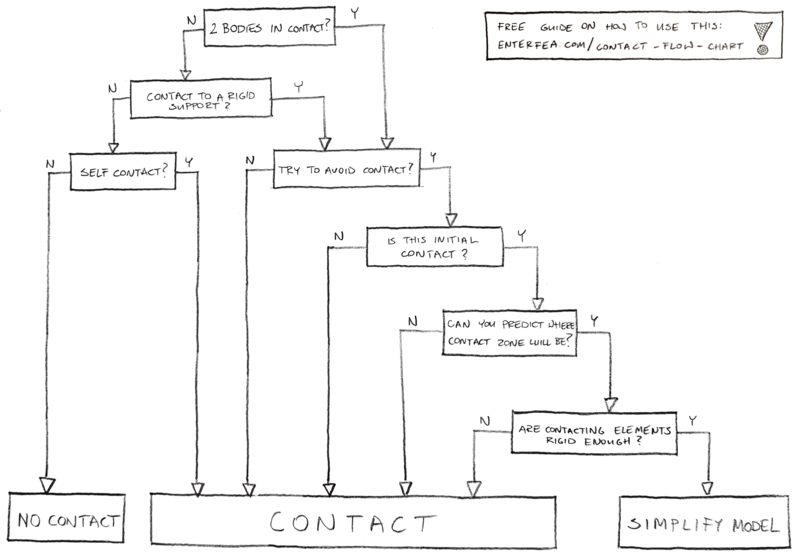 You have a model that shows nice outcomes without all the contact iterations. Is it you or am I touching myself? This is something I’ve left out for the very end. So far we discussed situations where 2 elements touch in your model or something contacts the support. But there is a 3rd possibility. An element can deform so much, that it will touch itself! Sadly, this means that it happens under big deformations, so you will simply have to use a contact in such case! Congratulations! You just finished the last flowchart I plan for now. If you missed the previous ones (do I need geometric nonlinearity and do I need material nonlinearity) be sure to take a look. Also if you like such posts let me know – I will try to prepare more of such flowcharts. Have an idea for a good topic? Let me know in the comments! If you enjoyed the post you can share it with friends – that would be a great help! I have a free nonlinear FEA course just for you! Subscribe below to get it!